Happy Days to you dear friends! How are you all this fine and glorious morn? I hope well. This has been a fabulous summer for the gang, and 1.5 weeks ago the kids started back to school. I thought I'd share their first day 'o school pictures with you all briefly. Katie is loving Junior High, she's in a few advanced classes including Band - and she will belong to the Jazz Band and Pep Band. Ian is in a 5th/6th split class this year. Because of this he has advantages to be able to work above grade level (which he needs because he's been coasting for several years now) - he's doing 6th grade Math with an option of possibly moving up to 7th grade Math if needed. Jake is in a 4th/5th split class this year. It's been a bit hard for him because he doesn't get recess time with Ian. Being twins, they sort of compliment each other. Jake depends on Ian to "break the ice" so to speak socially. Jake and Ian have a bond that only a mother of twins would understand. It's very strong. They go to each other before they come to me or Keith for comfort. So Jake is a bit outside his comfort zone. But we talk to him about "stepping up to the plate" and being a "big boy". He's doing great. Ellie is her last year of Pre-K. Next year she'll be a big Kindergartener and my last baby will fly the coop. Ok, lets not talk about it because....I can't yet. Thank you for sharing my four little reasons to get up every morning :) My little blessings. the kids are back in school, as I've said before, this time of year always makes me do a little "self inventory", and I always come up lacking in several areas. First off, my healthy lifestyle - now although I have not totally blown it this summer - I had not been to a Weight Watcher's Meeting (or weigh in) since May 14. I've beaten myself up mentally for the past several weeks about it. Well finally I quit doing the mental dance and the time was NOW last week on August 27th. I went to a meeting - I weighed in - took my wet noodle lashings and found out that all summer I only gained 5 lbs. Now that's not so bad. All the psychological turmoil for nothing. So I got all my books out re-read them, started fresh and you know what? I am feeling better about me. exercise....now I haven't totally blown this either this summer. I've not been doing the elliptical, but remember all those "pool days" I've mentioned. Well not to sound like the Rain Man, but I'm an excellent swimmer. Growing up with an in ground pool outside your door helped. I swam laps in the pool each time we went. And on most days my husband would get my rear-end out to walk our 2.5 mile loop up hill both ways. So I'm still in shape, but I'm ramping up the exercise now, I walk the loop in the a.m. and the p.m. on most days since school started. That's 5 miles a day. I'm not going to kid you, It stinks. I'm really hungry and I smell like a pig farmer by the end of the day, but its all about the burn. And you know what? I'm feeling better about me. my prayer life. I have been sort of walking a desert for a year or so with this area of life. My faith isn't questionable, but my prayer life is. So, I've been ramping this area up too. The past few weeks in Mass have had Gospel readings that help a person along on this walk and it's not about what a Priest says, or what someone can give you or do for you. Nope. This area - just like any area in life you want to change is all about YOU (or me in this matter). So I've been praying more. And my desert? Well its starting to bloom. And you know what? I'm feeling better about me. Happy day dear stitching friends and loyal readers! I have something fantastic to show you today, that I know you'll want to learn more about! I've been working diligently on this piece for about a month now. Sitting on it, waiting, knowing I couldn't say anything or hint at anything *yet*, but today I got the green light from my friend, Diane that it was OK to talk about today! So here I go! knowing that my family wasn't going to change, I've been scouring Family Samplers, trying to find the one that I liked that fit my "style". I have looked high and I've looked low....in fact I dug out all my Cross Stitch and Country Crafts Magazines (I own them all from first to last publication) and all my For the Love of Cross Stitch Magazines (ditto about the whole collection bit) and some other stitching magazines that I've been hoarding I mean collecting for years - not to mention clicking all over the Internet for that perfect sampler. I had a couple on my short list, until Diane sent me a picture of *the perfect sampler*. Whoa, who designed this pretty? Lo and behold, it was she! Diane had been working on a Family Sampler for some time, tweaking it to make it perfect for us fantatic I mean loyal stitchers.... and boy o' boy was I thrilled to bits when I clicked on the picture and opened up what is the Williams' Family Sampler. It was magic! I had to have me some of that good stuff! But Diane said it wasn't due out for awhile yet, no worries, I was going to get my hands on it! Pronto! as soon as it hit the stores! when one day about a month ago, a huge surprise landed in my mailbox! With Diane's compliments, she had gifted me with the Family Sampler, so that I could begin stitching and make sure that the directions were complete. I could tell that Diane was very nervous about the directions, but let me tell you, all I had to do was read through them once and off to the races I was! I started stitching the very day I received the pattern and here is where I am today, please let me introduce the Pfeiffer Family Sampler designed by: Little House Needleworks and will be in Local and Online Needlework Shops any day now!!! rather large for a Little House pattern, but I'm finding breaking it down into "Bands" makes the stitching go faster (or so it seems to me)! The placement of your surname goes under your family band and it is super easy to figure out placement - just grab a pencil and sketch it in on right on the graph - easy peasy! had me dreaming of strawberry shortcakes for the two days I stitched on it. I love how Diane charted these using two different Crescent Colours cotton floss, no two strawberries are alike - just like in real life and don't these look juicy enough to eat?! with my family sampler! I truly and honestly cannot wait until I have this puppy all stitched up. I recently redid my entryway at my house and I have *the most perfect* spot for this sampler when I have it stitched and framed. It's going to be a true family heirloom! the halfway mark as of today! I just have the top portion and the outside ivy/flower garland left. stitching victory will be mine!!! And I know it will be so SWEET! Don't you think so too?! Why don't you tell me....are you gonna reserve your Family Sampler copy today? I think you better because this one is going to be a "Greatest Hit" for Little House, I can feel it! Hello Friends and fellow stitchers! Last week a new family member was added to my extended family. Please join me in welcoming my newest nephew Weber Wayne into the world! A big congratulations to my brother, Jeremy and his wife, Ryan on the birth of their first born child! little Weber Wayne, Aunt Vonnie loves you! This morning, reading in our family bible, I realized I failed to share with you a treasure that I received a few weeks ago from a dear friend of mine, Cathy B. 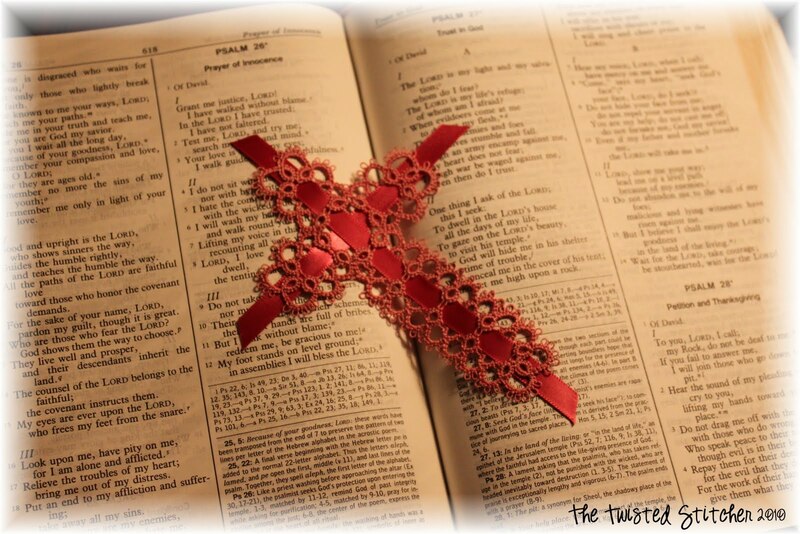 For my 40th birthday, Cathy sent a tatted cross bookmark made by her mother. Isn't it beautiful? Pink...one of my favorite colors and this one was the exact shade used in my wedding. Isn't it gorgeous? Thank you Cathy from the bottom of my heart, as this is a true treasure! my bookmark in the most precious book I own, our family bible. This morning I turned to the Psalms. There's something in there for everyone :) It seems every year during this time frame (late July - September) I get in this mental "funk". I used to think it was because I had to go back to school, then once I was out of school I used to think it was because I was too old to go back to school and now had to make my own living. Now....I don't know what to think about it...but just like the seasons change, so do I get this "funk" just like clockwork every year during this time. Thus the reason why I turned to the Psalms, there's always a salve to soothe your soul somewhere in the Psalms. I'm trying to find mine this morning and just wanted to share the treasure that holds my place.